Straight teeth, while attractive, also contribute to good oral health. Orthodontics is the dental science of repositioning the teeth into a proper bite. We do this with braces, retainers, spacers, clear aligners, and other devices. Many people relate braces with adolescence. However, adults, as well as children, can benefit from orthodontic treatment. More adults than ever wear braces these days – one in five orthodontic patients is an adult – but not exclusively for cosmetic reasons. The savvy consumer knows that you're never too old to enjoy the health benefits of a straight smile. For instance, symptoms like earaches, dizziness, headaches, and neck pain can all be associated with a misaligned jaw. Correcting the bite can alleviate these symptoms and improve function and comfort while reducing the potential for tooth wear. In addition, straight teeth are also less prone to decay and gum disease. For adults, we offer discreet alternatives to traditional metal braces. You can now opt for clear brackets (the part of braces that bond to the teeth and are spaced along the arc wire), and we may decide together that removable appliances such as Invisalign will work best for you. You deserve a straight smile! Do you dream about having a smile full of sparkling, straight teeth, but you just can’t imagine yourself wearing traditional metal braces? You’ve probably invested in a professional, mature image, and you shouldn’t have to look like a teenager to straighten your teeth, right? We agree and now, your dreams can come true. 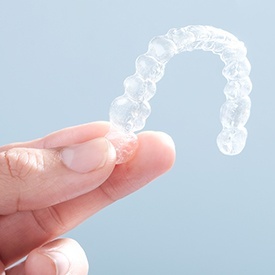 Invisalign, an orthodontic treatment approved by the FDA, is the virtually invisible method to straighten your teeth without conventional metal braces. With Invisalign, a custom-molded set of transparent, removable aligners will progressively reposition your teeth. You can even remove the aligners before eating, brushing, flossing, or special occasions. This technology is much more comfortable and convenient than traditional braces. Patients do not experience the mouth abrasions caused by metal and wires, and Invisalign aligners are very easy to clean. Adjustment appointments aren’t necessary, either. Then, a lab will create a series of aligners to reposition your teeth over one to two years. You’ll change aligners every two weeks until your smile is straight and beautiful. Typically, you will visit us every six weeks for progress checks.